The salt-and-pepper pairing of French filmmaker Claire Denis and the British band Tindersticks has borne much fruit over the last 15 years, some succulent and some tart. Denis’ astringent style might have seemed like an odd fit for Tindersticks, whose early albums were characterized by a doomed romanticism reflected in orchestral arrangements and Stuart Staples’ low, quavering voice. But it turned out to be a perfect match; films like Trouble Every Day, a sexually charged vampire film that makes Twilight look like Scooby-Doo, pulled the band into darker corners, and its music acted as a lush counterpart to Denis’ harsh worldview. After years of waiting, the band has finally collected all six (to date) of its Denis scores in an elegant box set, and just played a string of West Coast shows where it performed the scores live, accompanied by clips from Denis’ films. (They play one more on May 11, in Lisbon, Portugal.) Claire Denis Film Scores: 1996-2009 also covers a turbulent period in Tindersticks’ history, including the group’s breakup and (partial) reformation for 2008’s The Hungry Saw. On the phone from France, where he lives with his wife and four children, Staples recently talked to The A.V. Club about how the scores influenced the band’s albums, why he’d sooner write about colors than emotions, and the enduring genius of David Lynch. The A.V. Club: You’ve mentioned collecting the scores over the years. Was it just a question of logistics as to why it happened now? Stuart Staples: Yeah, I mean, I think it started with both the shows and the box set from finishing White Material. I think we were also pretty desperate to get it released. We felt pretty proud of it, and it just escalated from there. We were thinking about playing some live shows, doing the soundtracks live. It was just trying to shine a little light on this 15 years of work we’ve done. AVC: What’s the lineup for the shows you’re doing? SS: We’re doing all the shows as an eight-piece band. There’s so many different kinds of palettes for each film that we’ve had to find a balance of musicians who can shift from one instrument to another to make all those sounds for us come to life. AVC: You’ve done shows with large orchestras and string sections before. Did you not want to go down that route this time? SS: I think it’s only really relevant for Trouble Every Day. The way we’ve configured this, we have a violinist, we have a cello player, and we have a bass player that plays double bass too. We’ve tried to keep it kind of compact in a way that we’re a band, we’re a group of people. I didn’t want it to be some people involved that were outside coming in. AVC: The set spans a long time in Claire Denis’ career and yours, including a period where it looked like Tindersticks might have broken up for good. Was every recording circumstance different? SS: I think approaching every film had its own story. At this moment in time, looking back over 15 years, it’s like, “Wow, we’ve done all this work, and it feels like it’s just part of the process.” It’s not a given that every time Claire makes a film, we’re involved in some way. Some of them have been made in difficult times, yeah. AVC: Has the writing process changed over the years? Do you compose to picture, or from the script, or a general sense of what the film is about? SS: It starts off with some kind of casual conversation. When Claire’s approaching an idea, and she’s just exploring it in her own mind, if we’re lucky enough to get some time to just be part of that conversation and to get some grasp of what she’s looking for, that has really guided us. We’d get the script and sometimes we’d get rushes from the filming, but it’s when we get the rough edit, that’s when the real work starts. It was great to have all of those things before, because you’re building off a kind of understanding, but fundamentally, it’s about responding to the images, responding to the feeling and the pace and the colors. AVC: Going through the soundtracks in order, they start off riffing on Tindersticks songs, but by the time you get to The Intruder and the films that followed, you’re working much more with sustained drones and musical fragments. Is that in response to how her filmmaking has evolved? SS: With Nénette Et Boni, I think it was our song “My Sister” on the second [self-titled] album that made the connection with Claire. In looking back, there is a real relationship between the playfulness of that song, which is a song of David [Boulter]’s, and the playfulness of Nénette Et Boni, the way it’s made and the colors within it. I think the centerpiece of Nénette Et Boni was filmed to “Tiny Tears.” So that dictated something and got us in a certain mode of understanding the film. With Trouble Every Day, it was potent and fresh. The film was almost given to us like a gift. For us to make this really romantic score for this extremely sexually violent film was something quite special. I don’t think ideas like that come along very often when you’re able to do something like that, you know? With The Intruder, I was in a real different state. The band was falling apart at that time, and I think I felt quite extreme myself in that way. But at the same time, watching The Intruder and getting excited, I just didn’t feel any melody or the sense of character. Starting a film score from that perspective was such a huge challenge in itself. But they’ve all been different. With 35 Rhums, it’s life; it’s just a breath of melodica running through things. With White Material, it’s totally the other extreme, and it was complex and difficult for everybody. It made us explore a more abstract way of us making music. AVC: Has the work you’ve done scoring the films fed back into making solo records or later Tindersticks music? SS: Yeah, I think it’s done that in general. I think it’s one of the reasons we’re still working and still hungry to work, as well. I’m still exploring. As I look back, Nénette Et Boni had a massive effect on the album we made after it, Curtains. I think it’s been like that all the way through. Trouble Every Day had a massive effect on Can Our Love… I think it’s allowed us to raise our heads, take a bit of a left turn, explore different avenues, and then come back to our own thing and see it in a different way. AVC: What about The Hungry Saw? That followed a big gap, a period during which half of the band left. SS: With The Hungry Saw, we had a time away from each other. 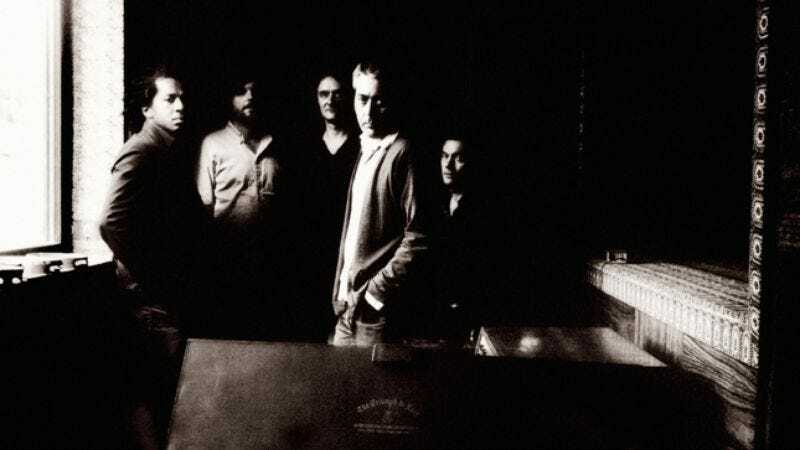 There was a kind of a growing feeling to make a Tindersticks album. At that point, it was very, “Well, let’s get together for a weekend and see where it takes us.” We started to write some songs. And then another weekend, and then it just kind of grew. It was almost as if The Hungry Saw started the second chapter. With that, working on 35 Rhums and White Material, it’s been a massive part of the last four years. I feel The Hungry Saw is isolated in its own little space. But I do think that since then, working on the latter two films, it’s been so involved our in momentum and how we feel at the moment. AVC: The band was fairly oblique as to who did what early on, but it seems Dickon Hinchliffe wrote most of the string arrangements. Is that right? SS: Yeah, definitely. But in general, the string arrangements were all part of the conversation. They came from a style of playing that was a conversation in a room, rehearsal in a studio. They were never separate from what we were doing. It was always a part of it. AVC: The score for Friday Night, which is credited solely to Hinchliffe, comes out of that orchestral orientation, which is closer to a traditional film score, and is what he does for a living now. What was it like to go back to scoring films after he left the band? SS: With Trouble Every Day, it was a real natural thing for that to be the forefront. And I think he did some really great work. I think we could have gone down that route for Nénette Et Boni. We had just made our first string album. But the film didn’t want that. Dickon did his work on Nénette Et Boni mostly on the piano. I think, fundamentally, that if you experience something, you have a response to it; it has an emotional effect on you. I think that’s fundamentally what we do. I’m totally aware that we’re not film composers, in a certain way. I have lots of respect for film composers, but that’s not really us. I don’t think we can just apply ourselves to a task, a job in hand. We have to be moved. We have to be motivated and inspired by something. That’s the basis of our work with Claire, really. With Friday Night, it was a really hard time, because we got so far into thinking about the film, and it just coincided with making our sixth album, Waiting For The Moon. It was something that, I felt, if we carried on working with the band, it would compromise that album. I think it’s worked out. Dickon went on and made the music for Friday Night himself, and that kind of set him on his path, which is a great thing, you know? AVC: The promo-only instrumental album Marks Moods, released around the time of Nénette Et Boni, was supposed to drum up more film-scoring gigs for the band. Did that pay off? SS: [Laughs.] No. I think at the beginning, we had this romantic idea about making film scores. The guys at Polygram at the time, they were very enthusiastic about that. It was the sort of time where we got to think about our music in a different way, in a more instrumental way. Thinking back, I think that’s where we were at, sort of wide-eyed and wanting to do anything and everything. Now, we’re a lot more understanding of who we are personally: what we need, what we’re looking for, and how it’s best to spend our time. That’s one of the biggest things for me with working with Claire. It’s been a diverting time from what we do, but it’s also been a real, valid time where we feel like we’ve achieved something. We’ve grown, and we think about music in a different way. I suppose I wouldn’t like [scoring] to be my job, is what I’m saying. [Laughs.] We’ve made five soundtracks in over 15 years, and it feels like the right sort of balance. AVC: It’s interesting to hear the scores isolated from the films themselves. If you’ve seen 35 Rhums, you can’t hear that melodica line without picturing a Métro train rushing through a tunnel, but the music stands on its own as well. SS: Thanks. When I see a movie, the music often gets in the way for me. It’s something that, say, for myself and Claire, we never, ever speak about. We never speak about describing emotion. I think it’s about color and movement. And I think it’s important to let the images be the melody, as well, a lot of the time—to create a kind of a backing for that, to let it sing. There seems to be such an insecurity with a lot of films. When they’re made, you have to pack every moment to feel something and use the music in that way. That’s something I just naturally don’t feel, and I think it’s the same with Claire. Sometimes when there is action, we just tend to avoid those moments with music, and have music in a separate part that allows you to dream and to make your mind up on where you’re at in the story. AVC: In White Material, some of the most dramatic moments are played without a score, and then you use droning to draw out some of the pauses in the story. SS: With White Material, we were just talking about it and thinking, “How do we approach making a film in Africa, this war-torn place?” I think we were nervous about it. [Laughs.] Once we got the images, we felt that the music was in the earth itself, and that, in itself, had some pain. So it was in the land. It was in the trees. It surrounded the characters. It didn’t describe the characters in any way. They just existed within this world and within this impending feeling. That, to me, is how the music tries to work within White Material. AVC: Has this changed the way you watch movies? Do you find it more effective when it’s used well, and distracting when it isn’t? SS: I’m so aware when you make a film, there are so many elements to get right. So many people with such important jobs. You know, it’s terrible. I walk away from a film going, “The cinematography was great, wasn’t it? But the music wasn’t so good. [Laughs.] The casting wasn’t great.” I think that’s a downside of it, really. But I suppose without that, I would just walk away nonplussed about it. I think you can find enjoyment in different parts, and then occasionally everything comes together and it can blow you away. AVC: Are there other composers whose film music you’ve discovered or have a deeper appreciation for, now that you’ve been doing it on and off for 15 years? SS: I suppose another way around it is that my daughter is 17 now, so her path is discovering lots of things, like music and film. It’s not so different from my own kind of journey at the beginning. So I find myself recently watching all the David Lynch films again and realizing how much of an effect they had on me then. That’s a kind of strange thing, especially realizing how revolutionary the way the music was used is. Just a few weeks ago, I sat and watched Blue Velvet for the first time in, I don’t know, 20 years or so. I think you realize just how deep it was, you know? Without realizing it then. I think you’re influenced by everything like that. If something moves you, you can’t help but soak it in in some way. AVC: David Lynch is definitely someone for whom sound is as important as music. He often uses low-register industrial groans or ambient tone instead of a conventional score. SS: Definitely. I think, in her own way, Claire’s very much like that. With White Material, I’ve got a whole folder of whistling. [Laughs.] It was very much about starting with more abstract collages. I think David was in Prague and we both got the film at the same time, and he started with electric guitar. It was bringing those two things together, and it was working together that formed this idea that was very much, for me, about chopping up these sounds that existed within the film and trying to understand it and find things within it that I liked in a way of additions. AVC: What’s next for the band after these shows? SS: After finishing these shows, we’ve got a period of time to explore a lot of the ideas that have been forming over the last six or seven months that we haven’t had time to explore yet, so I’m looking forward to that. It’s the best time of being in a band, really, when you’ve got ideas that spring to life in a recording situation or just in a rehearsing situation. When those vague ideas start to come together as something, it’s the lifeblood of what we do.